Exceptionally warm autumn went on and on in the Southern and Central Finland. After very warm November also the first half of December offered rather high temperatures: all time temperature record of November – 11.1 degrees – was measured in Maarianhamina on November 6. Like some other years lately, also in 2015 the beginning of ice fishing season has been late. Anyway, the surface waters are now near zero degrees. 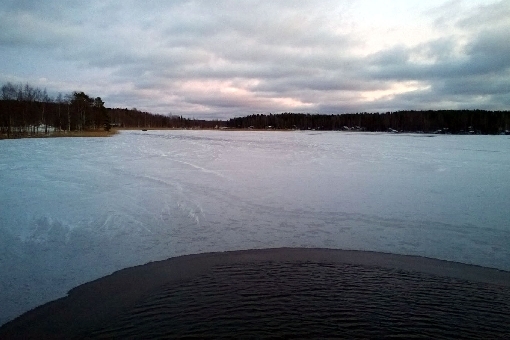 When temperature dropped clearly below zero on last Sunday evening in Central Finland, small lakes and bay waters of bigger lakes started to freeze slowly. If the weather forecast is correct, next days and Christmas time will not be very cold. So anglers must still be patient and wait colder days and nights and proper freezing of waters before they can go to ice fishing spots. Or if one can´t wait, he should head straight to Lapland, where lakes are already frozen. Merry Christmas and Happy New Year to all fishing fanatics! Photo. Also the bay waters of bigger lakes are starting to freeze. Lake Kukkia, Isosaari Island 15.12.2015. Photo: Ismo Kolari.